The intricate ornamentation of ancient Etruscan jewelry was the inspiration for this top, in which a lustrous gold-colored yarn and the varied surfaces of garter stitch, a simple lace border, and slipped stitches combine to create a richly textured fabric. 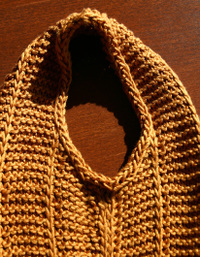 The pictured top has staggered waist decreases and increases; all slipped stitch columns curve slightly in and then out at the waist. But since the decreases and increases show slightly (look closely at photos), directions are also given for working all waist shaping at the sides only, if desired. 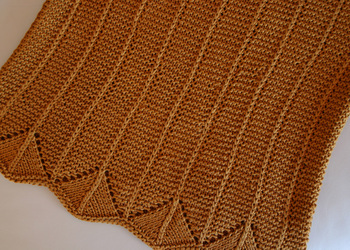 Front and back are worked flat to take advantage of the garter stitch base (knit every row!). Intermediate: skills include reading chart, increases/decreases, three needle bindoff, and picking up stitches for neckband and armhole trim. 20 sts/26 rows to 4” in st st; 19 sts/30 rows to 4” in EG (Embellished Garter) and charted lace patterns. EG and lace patt row gauges are different from that of st st (st st gauge given mainly to make yarn substitution easier); to calculate garment length you will need your EG row gauge. Check gauge on blocked swatch. SIZES & MEASUREMENTS for gauges 21 (20, 19, 18) sts to 4” in EG patt. Note that sizes S-XL do NOT necessarily correspond to the sizes given in the CYC standards. Bold #s are for gauge as given above; if only one # appears, it applies to all gauges. 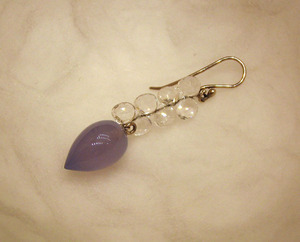 Shown in size S and gauge 19 sts/4”, with bust circumference of 34” and 1” ease. Karabella Empire Silk (100% silk), color 504 deep gold, 6 (7, 9, 10) skeins, or 540 (630, 810, 900) yds. US size 7/4.5 mm circular needle, 24” US size 7/4.5 mm straight knitting needles. Adjust needle size if necessary to obtain correct gauge. Berroco Touche’ (cotton/rayon), suggested color 7912 Dijon; Classic Elite Premiere (cotton/Tencel), suggested color 6212 Mimosa. Tilli Tomas Fil de la Mer (silk/seacell) on US size 6 needles for 21 sts to 4” in EG patt, suggested color Goldenrod; Berroco Touche’ on US size 8 needles for 18 sts to 4” in EG patt. Louet Euroflax on US size 5-7 for 18-22 sts to 4” in st st, color Mustard; Berroco Ultra Silk (rayon/nylon/silk) on US size 10 for 19 sts to 4” in st st, suggested color 6113 Dijon. Click here to purchase pattern pdf! Includes all written instructions, chart, schematic and photos. I've finished the pattern for Etrusca, but in pursuit of perfection, I'm giving myself a few days to proofread it. Not that I mind giving out a few free patterns, but I do so hate to make mistakes (ask my husband! ), and I hate even more to think of how annoying it is to have to troubleshoot a pattern you're in the midst of knitting. Ho finito il modello per Etrusca, ma nella ricerca della perfezione, mi sto concedendo alcuni giorni per correggerlo. Sono disposto a dare alcuni modelli gratuiti, pero' odio di fare sbagli (chiedi mio marito! ), e odio di piu di pensare come si da fastidio di dovere riparare il modello mentre si lavora a maglia. When I started plotting Etrusca, I thought that I would hide the waist shaping decreases in the sections between two of the slip stitch columns, the ones closest to the sides, so that the adjacent slip stitch lines would curve in and then out at the waist. But I didn't like the way this looked, with some lines curving in and others staying straight, so what I ended up doing was staggering the decreases, one in each garter stitch section (between the slip stitch lines), starting at the sides and moving toward the center, and then staggering the increases in the opposite direction, from the center out. The resulting curves in the slip stitch lines are very subtle (but nice, I think), but I find it slightly problematic that the decreases and increases are not invisible-- not completely. They show up in the photo as slight aberrations in the garter ridges. To a bothersome degree? Is it better to have the decreases (as in stockinette stitch) be plainly visible, rather than trying and failing to hide them completely? I can't answer that question for all knitters...which is why I'm also including directions in the pattern for doing all decreases and increases in the side garter sections only. Well, I never again want to come this close to running out of yarn; as it was, I unraveled my gauge swatch, fished one foot-long strand out of the trash, re-sewed both side seams using different yarn so I could salvage those pieces-- and here is what remained (at left). But it was worth it: this golden yarn, Karabella Empire Silk, has been burning a hole in the pocket of my stash for months. 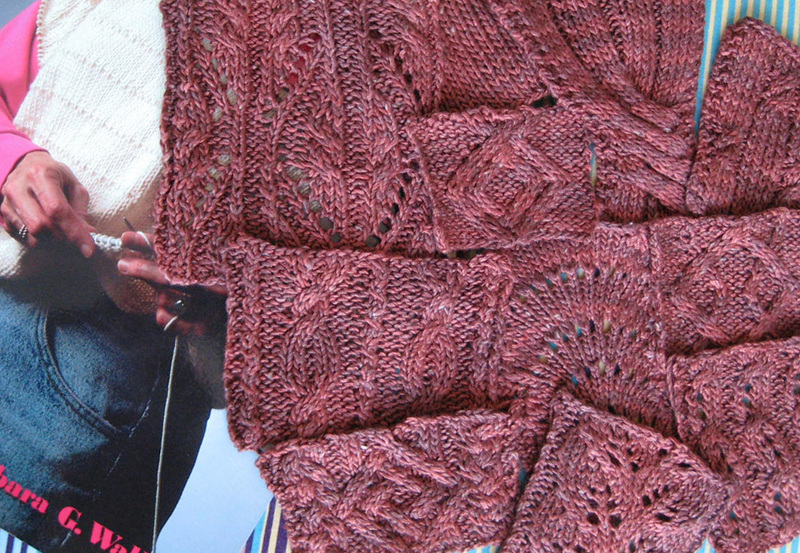 I must have bought it in late 2005 or early 2006, because I went looking for it after seeing Gabrielle Hamill's short sleeved top, worked in the same color, in the Spring/Summer 2005 issue of Vogue Knitting. I could only find 5 skeins in this colorway--not quite enough for Ms. Hamill's pattern (of which photos can be found on Ravelry, but none in the color originally shown in the magazine). 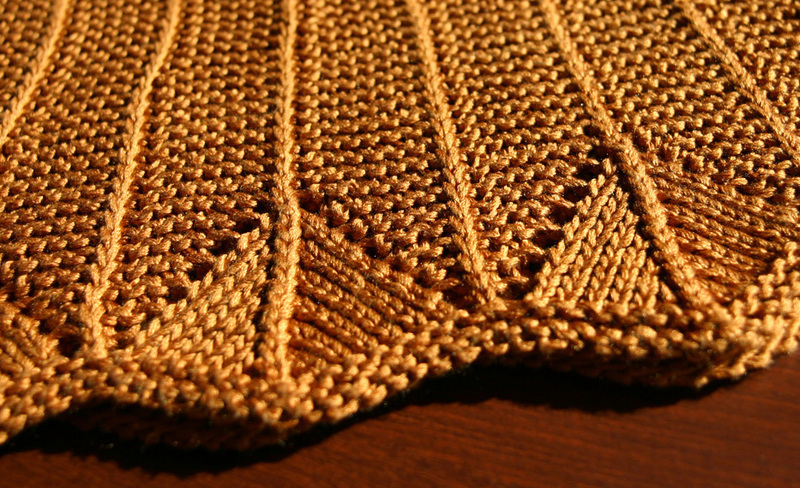 I thought the combination of textures in the swatches I made for this top would be wonderful with this yarn; texture, sheen and color together reminded me of ancient gold jewelry, especially Etruscan pieces made with gold granulation, a technique in which tiny gold beads are fused to a gold surface. Still, I was a little torn once I started, because the smooth surface of lots of stockinette really would have played up the sheen of the silk. 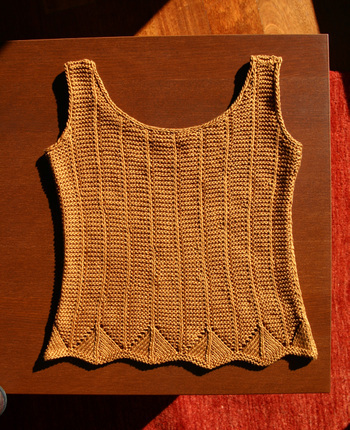 Plus, the garter stitch just seemed to gobble yardage; after getting halfway up the front, I gave up on the idea of a boat neck: this top wanted to have a scooped neckline, front and back! And sleeves? Even tiny cap sleeves? Forget it. I persevered-- I just really liked the slip stitch columns against the garter, and I thought the slipped stitches would tie in perfectly with a simple narrow I-cord edge around the armholes and neck. I picture wearing this top on a sultry summer evening, with a flowing skirt, or with white jeans...and gold jewelry, of course. I think I'll name it "Etrusca," after the pre-Roman civilization that inspired it. *My song didn't let me down. 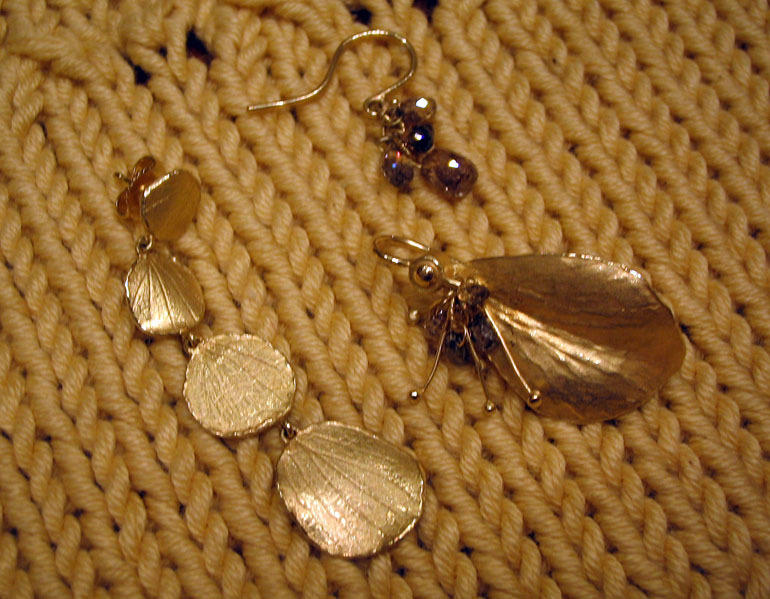 Sure, I'm inspired by a particular yarn, by "stitchionaries," by just about anything, but really, it all comes down to the earrings. Unlike some other knitters, I don't have a thing for shoes, nor socks (too many knitters to reference!) --you know, the feet are awfully far from the ears. Normally speaking. And in theory, I like bracelets and necklaces (in that order) but I just don't wear bracelets that much, and necklaces--I know it's an opportunity to make a wish every time you have to move the clasp around, but it just annoys me that the thing keeps inching around from the nape to the front of my neck. Someone should invent a decorative clasp that also holds the pendant, so the whole kit'n'caboodle hangs in front, without requiring any fiddling. I do have necklaces in which the centerpiece is part of the necklace, rather than hanging from the chain or cord or whatever, but every time I turn my head, it moves, and has to be re-centered. Can anyone tell me whether a little dab of superglue, or whatever it is that starlets use to keep their plunging necklines in place, might work in this situation? But I digress. 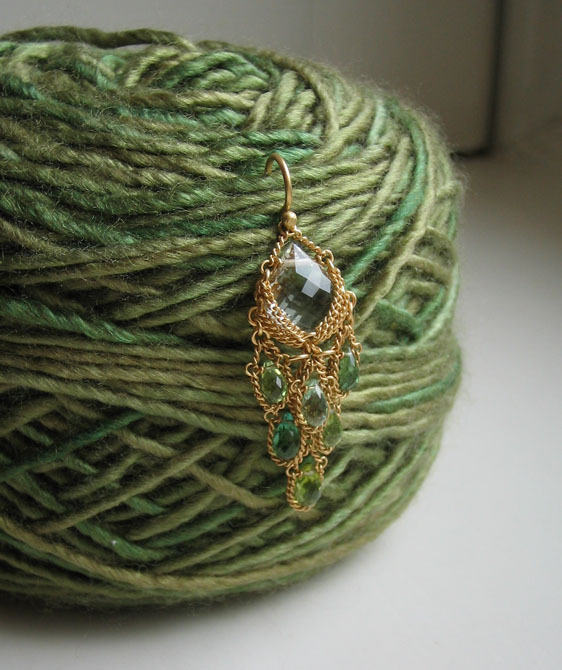 My point is, I often buy yarn with a pair (or two) of earrings in mind, and to a lesser extent, create designs to go with my favorites. 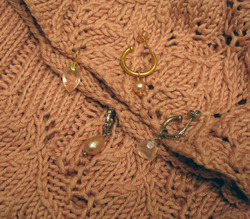 The chalcedony and crystal pair I got in Nantucket (above) inspired my purchase of the Classic Elite Posh I used for this sweater--unfortunately, not one of my better efforts. The yarn in the third photo must go unnamed for now, but it's a paler yellow than it appears in the photo--buttery enough to spread on toast, in fact. 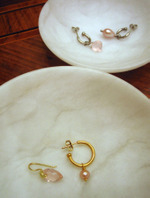 As you can see, I have a lot of pink earrings: top, rose quartz and pink pearl; bottom, the same. 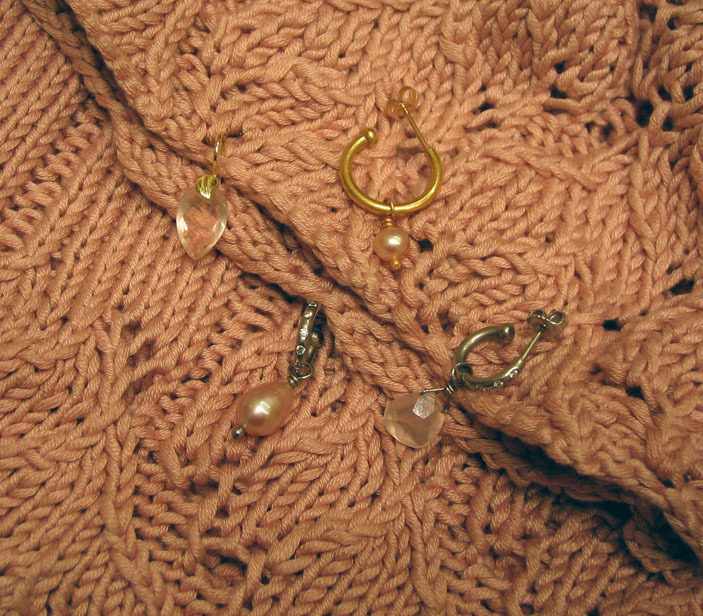 I bought the yarn for this sweater because I realized that I had hardly any clothes to go with all those pink earrings. I don't dislike pink clothing, necessarily, but the color must be just right: for me, hot pink and pastel just don't work, but a pale pink, almost neutral, or a dusty pink--those are possibilities. This Empire Silk yarn, from Karabella, is absolutely gorgeous (the bad photo doesn't do it justice), and it's sitting in my stash waiting for the perfect pattern. When I purchased it, I could only find five skeins of that lovely deep gold...I wonder if I should buy more, now that kpixie seems to carry it. Anyhoo. I've saved the best for last. I love, love, LOVE these confections. 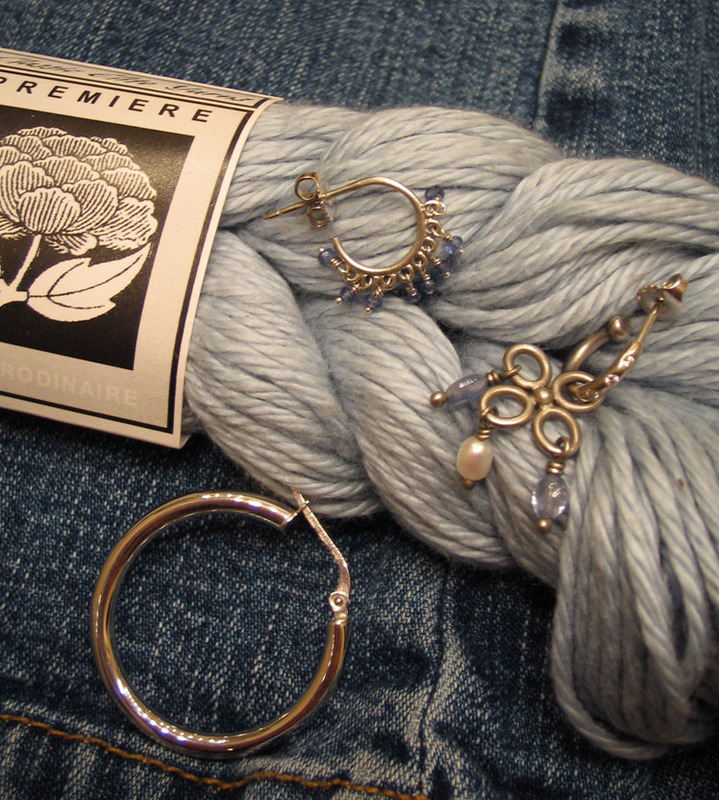 And the yarn ain't bad either: Alchemy Yarns Synchronicity in "Good Earth."